The last place Los Angeles Dodgers are 28th in the major leagues in scoring. With the 25 man roster looking more like a M*A*S*H unit the team has decided that it’s time to call up top prospect Yasiel Puig. Puig is hitting .313/.383/.599 on the season with eight home runs, 37 RBI and 13 stolen bases in 40 games for the Chattanooga Lookouts. To make room on the roster the Dodgers optioned right-handed pitcher Matt Magill who was called up to start in place of Hyun-Jin Ryu. The Dodgers signed Puig to a seven-year, $42 million contract last summer and has played a total of 63 minor-league games in his career. 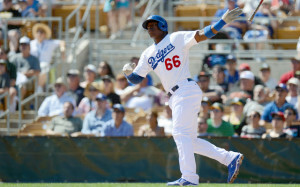 Puig hit an impressive .526 in spring training but with the dodger outfield that was made up of Andre Either, Carl Crawford and Matt Kemp there wasn’t room for him on the roster. Kemp Is now on the disabled list and Crawford has a bum hammy. “Any time somebody walks into the stadium and gets an opportunity, it’s a chance for the start of something big,” Dodgers Manager Don Mattingly said.